First off - Happy Valentine's Day! Since it is the "day of love" we thought we'd share two books that we have been listening to lately that we just love. Both are from Barefoot Books which is not at all surprising. We've been a big fan of their books with sing-a-long CD's and generally enjoy them thoroughly. Barefoot Books kindly sent us two different titles recently and we're here to talk about them today. Recently we've (i.e., Bookworm1) has taken notice of dragons and dinosaurs. Both are fascinating, but dragons more so. He was surprised and delighted when I pulled a copy of A Dragon on the Doorstep . If you are unfamiliar with Barefoot Book's sing-a-long stories, you really ought to check one out. Along with the book comes a CD of music with a song that accompanies the text in the story. Generally the song is sung by a familiar children's artist whose name you will generally recognize. 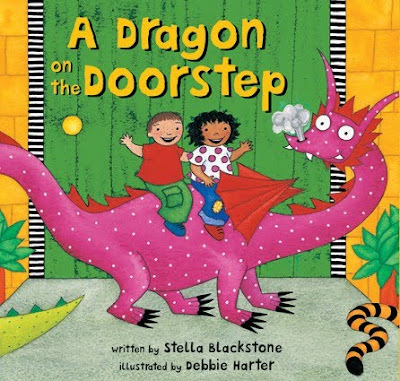 In A Dragon on the Doorstep we can either read the story or sing the story along with artist Fred Penner. In this particular book we meet two children who are finding all kinds of animals (including the dragon!) hidden around the house. It's a gigantic game of hide-n-seek with exciting surprises like - spiders in the attic, bears in the bedroom and gorillas in the garage. "Let's listen to it AGAIN. I like, like, LIKE this book! I LOVE all of the animals." That, by the way, is a direct quote. 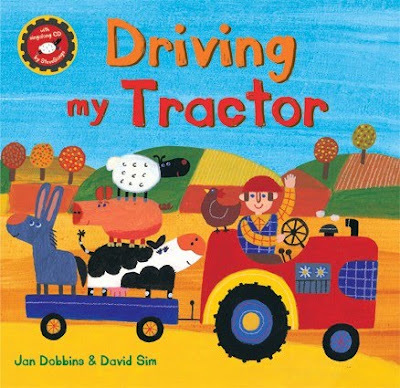 Secondly, we were sent a copy of Driving My Tractor which is a new release. This time we can either read the story or sing-a-long with SteveSongs - who has a very pleasant sound about him. I suspected that Bookworm2 (age 2) would enjoy this one more than the last because it involves a large vehicle and tractor sounds. Neither he nor I were disappointed. In this particular story we meet a farmer who is driving along in his tractor picking up various farm animals. At the end of his drive, his tractor hits a rock and all of the animals scatter. It's cute and it is fun and full of sounds - from the tractor to the animals. Of course, we were pleased with both books and songs - each one appealing to a different boy for different reasons. Both we highly recommend. Thank you, Barefoot Books, for sending these books for us to enjoy and to love! We've been hearing a lot about Barefoot Books. They seem to be right up our alley, esp these two titles! We just checked out a Stella Blackstone book last night: Octopus Opposites. LOVED the artwork! Oh yes, *Carrie* - we've checked out Octopus Opposites and loved that one as well! Glad you mentioned it again. I have been a fan of Barefoot Books for a number of years. In 2009, I decided to live Barefoot and become a Barefoot Books Ambassador. "Driving My Tractor" is one of my children's favorites.